Proprietary Name: Mucus Relief Dm Extended Release Caplets Maximum Strength What is the Proprietary Name? Non-Proprietary Name: Guaifenesin, Dextromethorphan Hbr What is the Non-Proprietary Name? 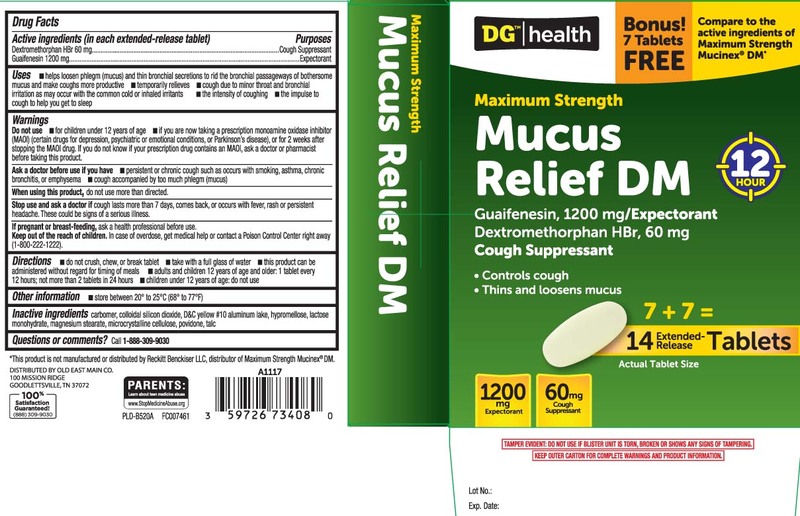 Mucus Relief Dm Extended Release Caplets Maximum Strength with NDC 55910-634 is a a human over the counter drug product labeled by Dolgencorp, Inc. (dollar General & Rexall). The generic name of Mucus Relief Dm Extended Release Caplets Maximum Strength is guaifenesin, dextromethorphan hbr. The product's dosage form is tablet and is administered via oral form. FDA Application Number: ANDA209692 What is the FDA Application Number? For children under12 years of age if you are now taking a prescription monoamine oxidase inhibitor (MAOI) (certain drugs for depression, psychiatric or emotional conditions, or Parkinson's disease), or for 2 weeks after stopping the MAOI drug. If you do not know if your prescription drug contains an MAOI, ask a doctor or pharmacist before taking this product.